The First Congregational Church is one of the most historic buildings on the Village Green and its history is closely intertwined with the town’s history. The congregation celebrated its 300th anniversary in 2016. 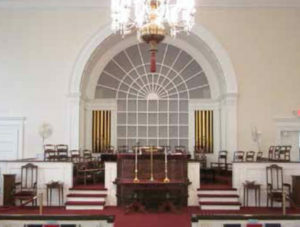 The current sanctuary, the third one used by the congregation, was built in 1833 and expanded in the 1890’s. Over the years the church building has housed the town hall, the town’s Youth Agency, and has provided space for many local organizations. In the winter of 2010 ice was a big problem all over New Milford. The weight of the ice caused structural damage which deflected a ceiling beam as illustrated in the drawing. 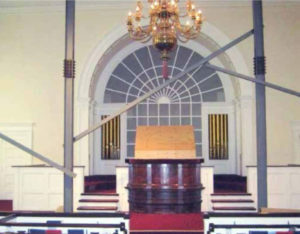 Without additional support the beam was in danger of collapsing. The church was closed for inspection and temporary repair. Structural steel was installed at the point of failure as illustrated in the photo to the left. While the steel makes the building safe, it greatly diminishes the interior beauty and functionality. This is a difficult problem to repair. The failing ceiling beam will need to be pushed up into place and secured with reinforcements. In order to minimize ceiling damage, this will be done slowly over several months. Once this repair is made the interior steel can be removed. The repair requires a contractor experienced in working in historic buildings. Although great care will be taken, it is impossible to know how much damage will be done to the plaster ceiling when the beam is pushed into place. If you would like to help “Raise the Roof,” you can do so through the “Raise the Roof” fund at the Connecticut Community Foundation. 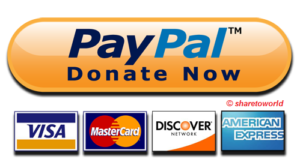 You can also use PayPal page (see link below) or send a donation to the First Congregational Church, 36 Main St, New Milford, CT 06776. (Please note “Raise the Roof” on the check or your PayPal donation). Thank you for helping restore this historic building.